Goodreads says, "Their love was meant to be. When Megan Rosenberg moves to Ireland, everything in her life seems to fall into place. After growing up in America, she's surprised to find herself feeling at home in her new school. She connects with a group of friends, and she is instantly drawn to darkly handsome Adam DeRÍs. But Megan is about to discover that her feelings for Adam are tied to a fate that was sealed long ago—and that the passion and power that brought them together could be their ultimate destruction." Megan moves to Ireland for her dad's job and quickly assimilates to the culture and her new school. She makes many new friends and she can't help herself about one thing. She's interested in resident bad boy, the elusive and good looking Adam. Megan learns that there's more here than just an attraction between the two, but rather a history layered in Celtic lore. Carrier of the Mark by Leigh Fallon is a debut that has moments of greatness intertwined with the usual cookie-cutter YA cliches. Megan is not my favorite YA heroine; in fact, she is more Bella Swan than I'd like. She's too dependent on Adam and not feisty enough for my taste. She was too obsessed with Adam and although their relationship was adorable at times, I felt for the most part it wasn't believable. There was simply too much emphasis on it. For example, the fate of the world was dependent upon whether she dates Adam or not. I'm not kidding. There was also an insta-love attraction between the two and I understand why since there is a "history" behind it all, but I just had a hard time dealing with it. It felt too Twilight-ish for me. On the bright side, I did enjoy the magic and the Celtic lore in Carrier of the Mark. I thought that the premise was unique. Fallon's take on magic and elements being carried through genes is pretty interesting. Also, I especially enjoyed the setting of Ireland and I'm sure this doesn't come as a surprise since I love Ireland! The town of Kinsale is perfect for a YA paranormal. The towns of Cork and Dublin as well as the famous Trinity College were visited by Megan and it made me want to plan a trip to Ireland again. All in all, I think that young readers, such as my students, would enjoy this novel and probably won't be bothered by some of the things that bothered me. 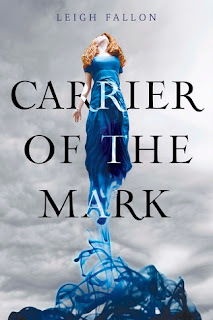 For fans of the novel, you'll be happy to know that Carrier of the Mark will be part of a series with the next book, Dawn of the Knights, due out in early 2013. I'm sorry to hear this was so disappointing. Megan does not sound like a character I'd like-she reminds me of Meghan Chase from The Iron King. While Meghan Chase does improve as the series goes along, I'm not patient enough to try this one. Good review though. Have you ever tried Juliet Marillier's Celtic fantasy novels for adults? I think you'd like them. I'd suggest Daughter of the Forest (first in the Sevenwaters series). It is set in Medieval-ish Ireland and is a retelling of the fairytale The Wild Swans. This book has been getting a lot of 3 out of 5 ratings. I think the anticipation for it might of been too much to the point it could never live up to it. She even had a blurb on another book before her own was released, which to me is peculiar. I'm still intrigued by the story though. I love that it's set in Ireland. If you like strong heroine, check out Half-Blood by Jennifer L. Armentrout. Christina- Thanks for visiting. I will have to check out this series you speak of. It definitely sounds like something I'd enjoy. Thanks for sharing! Petra- You should still check it out --the setting was incredible. I will have to check out Half-Blood. I've been hearing some good things about it! Thanks for visiting. Leanna- I would love to hear your thoughts on this one! I hope you get your hands on a copy soon. Thanks for stopping by. I may try Daughter of the Forest, instead. I'm not a Twilight fan. You`re right, Ireland has so many perfect settings for YA paranormal. The Celtic history lends itself perfectly. I agree that the insta love was a little too much but I'm not sure I'd compare Megan to Bella. She has her own power and she's not afraid to use it! That already makes her 10x better than Bella would ever think to be! LeeAnn- If you try it, be sure to tell me what you think! Thanks for visiting. Christa- Good point. I see what you are saying. I guess what I meant is that Megan, like Bella, is completely wrapped up in her man. Thanks for visiting!